I also forgot there is a very easy way to get the dwarves and Mulhorand to cooperate - Religion. Ptah is a dwarf. Anyway, I liked my idea about the Pharonics having given the dwarves the power to control griffons, so I won't lose that, even though I have Ptah to connect them now. Sorry, I am late on this point but I would like to add the following. From Demihuman Deities we know that the dwarven god Vergadain subsumed the Mulhorandi deity Bes, we know from other sources (like On Hallowed Grounds) that they were on good terms before so it must have been a voluntary merger or relinquishing of power. Also Geb his allied with Moradin. So there are quite a lot of deific points of contact between the Mulhorandi and the dwarves which to me says that there was an healthy relationship of mutual respect between the two people (probably Mulhorand is the only human society as tight-knit and granitic as the dwarven one). They both like to build really BIG things out of rocks. So I am STILl trying to put some finishing touches on a map, and I decided to include the ruins of the Twelve cities of the Sword (Jhaamdath), and after I pasted the GHotR map into mine (and they lined up far better than they should have - I thought that map was based on the 3e one ), it turns out several of those cities are under 'current' cities. Surprise, surprise. Jhirrent is under Daroush - I mean directly under. Daroush itself is a ruin, so its a ruin on a ruin (in Turmish). Golmuth falls out under Hlondeth, which is interesting. Yuan-ti and psionics. Corrant is under Mimph, which I believe is an independent citystate (not part of either Chondath or Sespech). Inixrien is a tough call. Its obviously on land (unlike most of the others, but it looks to be just east of Samra (in Chondath). This can go either way, since the maps aren't all that precise, and I am torn. We could simply say Samra was built on top of the ruins of Inixrien (like those others above), or we could say its a ruin a few miles east of Samra, right on the coast. Unfortunately, the second choice makes the most sense with me looking at the map, but it doesn't make sense that such a ruin was never shown to have been there before. My thoughts here are that I can use 4e to fix this - it was under water, just off the coast (and people knew there was a ruin there, but they didn't know its nature and just ignored it), and after all the weirdness of the Spellplague the ruins were exposed (as were all the others that weren't under newer cities), and after The Sundering fixed the Vilhon Reach, the ruin is only partially submerged now - half under the water, and half out, right on the coast there. The only other of note is Porrenoth, which is just off the coast, directly SE of Amah (not sure if Amah is a part of Turmish or not). Its close enough to the coastline to perhaps be visible from the surface now (maybe a couple of taller towers sticking out of the water - something like that). you know, If Ao fixed the Vilhon reach just like it was, and people started to occupy - or at least investigate (archaeology) - those ruins, then they all got drowned again. Moving on to Sespech - it got pretty beat-up in 4e. Spellplagued lands everywhere. My thoughts here is that most of that stuff went to Abeir (or elsewhere), and a lot of it came back, but its changed (like how we pictured parts of Chessenta and Unther). Nothing too crazy like dragonborn, tieflings, and Genasi - more of an aesthetic change. I'm thinking red. Not as in 'Native American' red... I mean RED red. We can't really do blue or green because then they'll just look like seafolk. 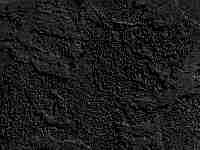 Drow already have black, dark brown, dark blue, and purple covered. We have all the other normal human skin tones covered. I don't think 'Yellow' would be dramatic enough (everyone would just look jaundiced - I had Hepatitis and I was bright yellow for three weeks). And orange.. well... maybe just the leader (but we'd have to give him some medusa-like epic hair). But seriously, what does everyone think of that? The Wilderlands campaigns setting had people in every color, and I thought that was cool back in the day. We wouldn't need to make any rules changes. But I suppose we should make some sort of differences with the culture because a century living on another world changes people. I am also considering bringing over the Red Steel setting's Cinnabryl, in order to explain the Red pigmentation. Wherever these folks went, it had tons of the stuff, and a lot of it could have come back with them (which means we can still use the Spellscar rules, but instead have them as Legacies, so we can have a region of mutants'). I know you were thinking of using something similar with the Red Forest. Where was that from, BTW? Was that canon? I just realized I hadn't placed that forest. Anyhow, we can easily connect the two - say this whole region on Abeir is loaded with some sort of red-tinged mineral that soaks into everything. Anyhow, I just figured Sespech could use a little sprucing up - its never received any official love, and is right in the middle of the setting. Something strange and awesome needs to be going on there. Scratch red -I just realized tieflings are red, and then these folk would just look like hornless tieflings. I was thinking more 'Darth Maul', but without the horns (why does everything with red skin HAVE to have horns?!) So now I am thinking even more exotic - Catfolk? there is a 'catfolk area' just to the north, so that might be redundant. I'm still thinking a 'Savage Coast' (Redteel) vibe would have worked best. Sespech is located right stop the pit of jhaam (in the underdark) and it's populated by Shaarans that were kidnapped from the central shaar/lake of steam by jhaamdath. That's all I've got on it for now but I've not looked at it much yet. Though they didn't adapt to it as fast as Raumathar/Narfell, they also learned of steel manufacturing from the dwarves of the great rift. They did a lot of trading with the dwarves. I had not noted that with Bes though, and that is interesting. If I had to do anything with that, I'm not sure what I would do. Maybe Bes died in the Orcgate Wars? I'd once theorized that the orcs somehow learned to use the gate up in Ashanath that connects to the Council Hills in the Shaar (and this is WHY the humans just 5 years after the orcgate wars know how to open the portal to create the city of Shandaular). I'd thought that maybe this is WHY Unther lost so much territory down in the Shaar and how the orcs perhaps killed so many of the Untheric gods (they caught them off guard and from behind). If this were true, then having Bes appear in the path of the orc horde streaming towards the great rift could be possibly interesting. There was the red mineral forest of Shyr that I was creating, then there was also firetrees. I was picturing something looking like THIS (minus the pointy ears), or THIS, or THIS for a male. Red-skinned, and maybe clothing/culture reminiscent of Persia (Yeah, I know we already have a Persia over in Semphar, but no-one every used the damn thing, and now there are dragons pooping all over it). But with maybe some of the tattooing we see on the Dathomirian Zabrak (Darth Maul's race). So a psuedo-Persian vibe, but with tribal tattooing similar to Celtic. I suppose black shapes and symbols would be the most common, but there could be other colors (like white) to denote something special (like a religious order). Maybe something like THIS without the head-thingies for an example of white 'tattooing'. Given that its right near the Chondalwood, it could be interesting if my idea for the red mineral forest of Shyr were actually expanded. Basically, I had placed the red mineral forest next to Firetrees in Unther. However, what if there's another section of the exact same kind of trees and soil that transfers into portions of Sespech. I had been trying to figure out what to do with the ruins of Innarlith. Maybe these people transferred, but their homes didn't, and now they've taken over this old city. I do like the imagery your describing as well and perhaps the two separate cultures may somewhat LOOK alike (i.e. red skin), but their cultures are vastly different somehow. I picture the ones in Sespech as more martial for instance. Maybe psionic as well.... of course, the sith imagery may be driving that. Its funny, but I just went looking for 'red skinned people' (and that's not easy - I had to word it so many different ways jst to find a few pics of something similar) - I hadn't intended to connect them to Jhaamdath or psionics, and there wasn't a lot of imagery for me to choose from. And yeah, I was thinking along the same lines - whatever portion of of Abeir this region corresponds to, it probably has that 'red mineral' throughout it, so from Sespech across lower Chessenta on into Unther would have it, in different concentrations (depending on how much got swapped-out during the Spellplague - parts of Chessenta and nearly all of Sespech got hit hard). So, like a Persian-esque style/culture, maybe Spanish (Moorish) architecture, but with a militant tradition (probably wherever they went in Abeir, they were under constant attack), and they're fighting style would be akin to the gracefulness of elves (like bladedancers, but with various, Asian-style weapons). I am really loving This Vibe for Sespech, even though I've always complained we've had too any 'Middle-Eastern' style cultures already. The use of giant scorpions instead of elephants is pure win, IMO. Maybe not Scorpions - I'll save that for somewhere else more fitting (like the desert region of Katshaka). But I do love the idea of something else taking the place of elephants. Maybe some sort of dino could work (although I wanted to save sauroids for katshaka as well). Something Like THIS would be kinda cool, and not dirivative or saurian-based. I need to look through the Athas creatures - I am sure I can find something there I can adapt. I added a page about Spellweavers to try and tie in George Krashos' excellent article on Jergal Lord of the End of Everything with a few of my developing ideas about the origin of Untheric and Mulhorandi culture and a few stray quotes about a race that may have warred with the sarrukh long ago. Hmmmmmm... I didn't want to create any sort of 'racial tension' thing. However, Ormpetarr seems to have been unaffected (mostly), while the rest of Sespech went bye-bye during the Spellplague, so folks in the capitol would still be 'normal colored' (and GAWD, did it feel uncomfortable typing that just now... which is why I wanted to avoid racial stuff). Interesting - I had never thought about Sespechians having dark skin, and it was stupid for me not to. I pictured it having a bit of a Portuguese vibe (due mostly to Mapolq's work on the place). Its a good fit - a 'Moorish' (displaced Middle-Eastern) culture in a mostly Europe-like (Mediterranean) region. 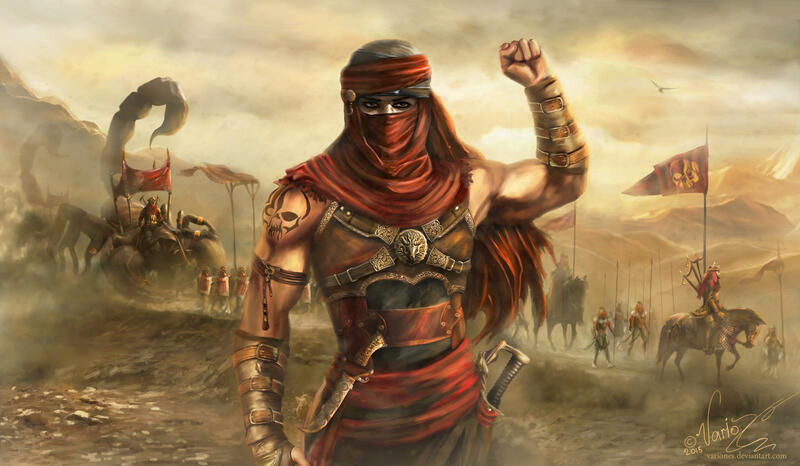 The Tashalar have the same vibe, and they are also Turami, and it makes sense the Turami got literally 'split' when Chessenta spear-headed into a mostly Turami-settled region. So now I have to wonder, were the Jhaamdathans Chondathan (Dathite), Turami, or a mixture? I'm thinking a mixture would work best for us (hybridization often leads to superior mutations... like psionics). I also found some interesting stuff regarding the history in SoFS, of all places. Apparently Steven Schend was actually using Jhaamdath (did he create it then?) to explain-away the confusing history in Old Empires. Many Vilhon scholars - purposely or not - have 'forgotten' Jhaamdath, and a lot of Jhaamdath's history has been respun as 'early Chondath' history (so the parts about Chondath trying to conquer Chessenta was really Jhaamdath, which makes sense now). And thanks to your comment, I went looking to make sure I spelled Mapolq's name right, and looked at his Sespech thread, and found that I had discovered a few sites for him that I forgot to put into my own notes. Serendipitous, no? I have another fallen Realm (where Sespech is now - Maurmurra), as well a cool ruin (Castle of Beasts). SWEET. And rereading the pertinent section in SotM, I found Nagarr had an old name, which I am now going to use as a new name for it (since they renamed it 'Kagarr' in 3e, and I hated that so kept both). Thus, now that the Sespechans are back from their interplaner field-trip, they've taken to calling the town by its original name - Yacla. Getting back to the racial thing and other changes - the capitol is mostly olive-skinned (I always felt that was an odd turn-of-phrase... ah, well) like Sespechans are expected to be, but the returned folk are reddish, and although there has been some mixing (its only been about a decade), there is still a growing attitude of Apartheid (real or imagined). Further afield (literally), I just a little while ago took all the regional text and dropped it down to one layer, and now I see I am going to have a problem with The Golden Plains, which turned into Plaguewrought Lands in 4e. I had simply turned it back into what it was, but that's no longer optimal. I may rename it the 'Redgrass Plains', or some-such. Or, since the original grasses were yellow there, maybe they've been absorbing the red stuff over in Abeir so now they are orange? I hate using 'orange' because it also already a plant (and its one of the few damn colors that doesn't have an alternate name). Hmmmm... in heraldry a brownish-orange is know as Tenn�. Perhaps the Tenn� Plains? Also, the racial mix of Chondathans with their brownish/tawny skin and these red skinned folk may end up being the kind of blotchy that you were showing with the Star Wars folk. Rather than a smooth mixing of their color, maybe it end up with more of a mix of the red and brown/black. That might in fact be a significant look difference than say the folks that I put in Unther, and its because of the racial mixing. Well, the reddish skin tone is because of the strange mineral in the soil, which leeches into the water and everything else. I would assume that - if enough of the mineral 'came over' (which is what I plan), then the existing Sespechans (Ormpetarr, etc.) will gradually change as well. So the next generation nearly everyone will be red, unless they live in some remote place where the mineral hasn't tainted things yet. On the other hand, the mineral could eventually 'run out', because its source is probably back on Abeir (maybe) - I would think its a primordial (dead, alive, or sleeping). 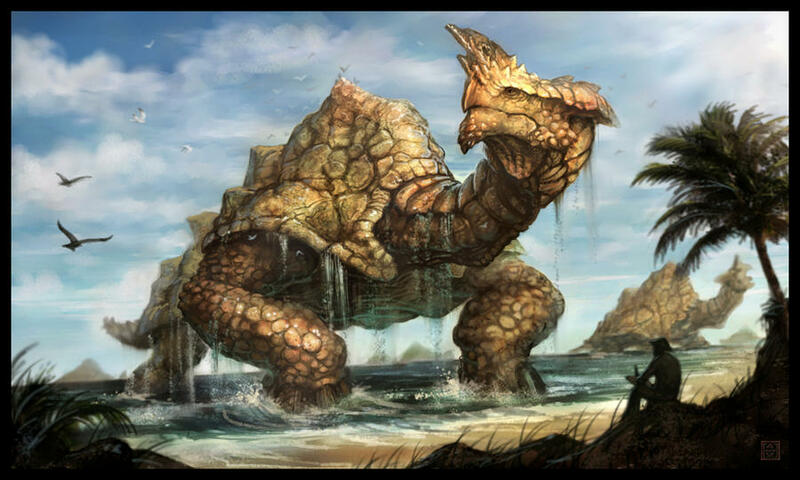 So anyway, a culture like Dorne from GoT, with red skin, a military mindset, Moorish architecture, and instead of using elephants like Persia, I am thinking the use turtles of varying sizes. Smaller ones like 'pack animals', and really huge ones like (very slow) war elephants. Not sure though about turtles...I can't seem to make up my mind. Maybe something closer (looking) to a dragon-turtle. So I linked the stone colossus around mulhorand to the spellweavers and a war between the spellweavers and the sarrukh of okoth. This means placing a spellweavers node in the old empires and I chose to place it in lake azulduth. The order of events is the spellweavers attempted to enslave the sarrukh but they prove too strong, so next they attempt to eliminate the sarrukh by manipulating them to create/contact the phaerimm. The ensuing war between phaerimm and sarrukh and spellweavers is only interrupted when the spellweavers contract a horrible disease known as the Darkness, which interrupts their rejuvenation process and turns them into piles of star shaped gems. The spellweavers abandon their node and flee to the far corners of toril. 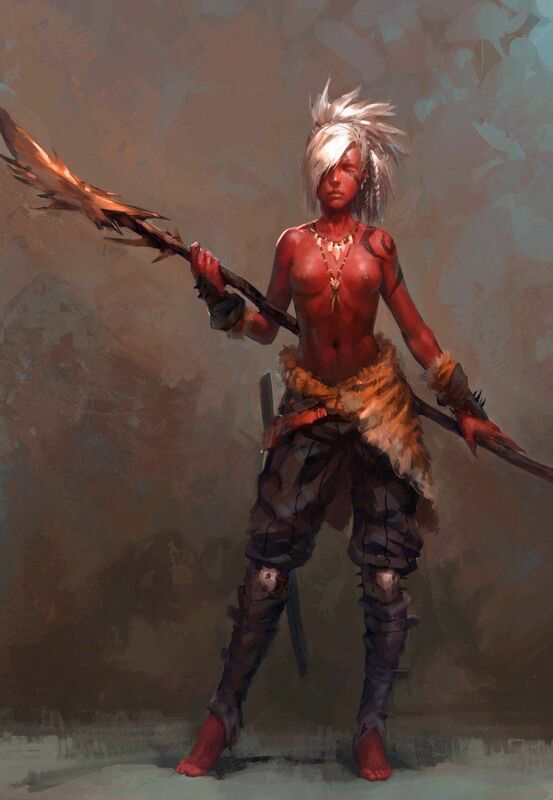 They establish the colony of Eril in anauroch and later encounter the sarrukh again and try to destroy them by infiltrating their society and helping them create the nether scrolls. At this point the history follows what George laid out in his article on Herba except that when the spellweavers perform the Disjunction the node in Azulduth goes into meltdown and creates a huge crater with a hill in the middle (the top of the node) as it melted the ground beneath it and sank. I chose the name of the disease deliberately to link it to another disease that affects another nation in this region. Im thinking that i will have the disease actually be the hakeashar draining the magic while the spellweavers are rejuvenating. The spellweavers don't realise it is an extraplanar being killing them so they think it's a disease. Herbal later uses these extra planar beings against one of his foes and it has a different end result (humans don't turn into gems when they die although their soul sometimes stays behind). Well, the reddish skin tone is because of the strange mineral in the soil, which leeches into the water and everything else. I would assume that - if enough of the mineral 'came over' (which is what I plan), then the existing Sespechans (Ormpetarr, etc.) will gradually change as well. So the next generation nearly everyone will be red, unless they live in some remote place where the mineral has tainted things yet. On the other hand, the mineral could eventual 'run out', because its source is probably back on Abeir (maybe) - I would think its a primordial (dead, alive, or sleeping). I guess I'll stick with horses for their cavalry then. 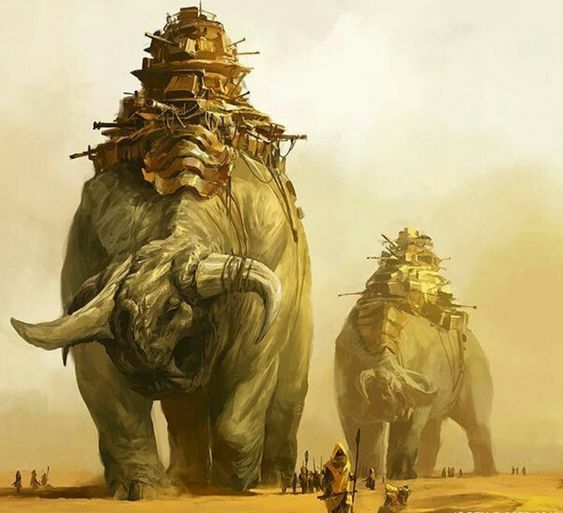 Still I want some 'kewl' large critters for at least pack animals, or to take the place of war elephants. I kinda like THIS GUY - would probably work even better down in the Shaar (which is right next to Sespech), plus that illustraton is already WotC property! 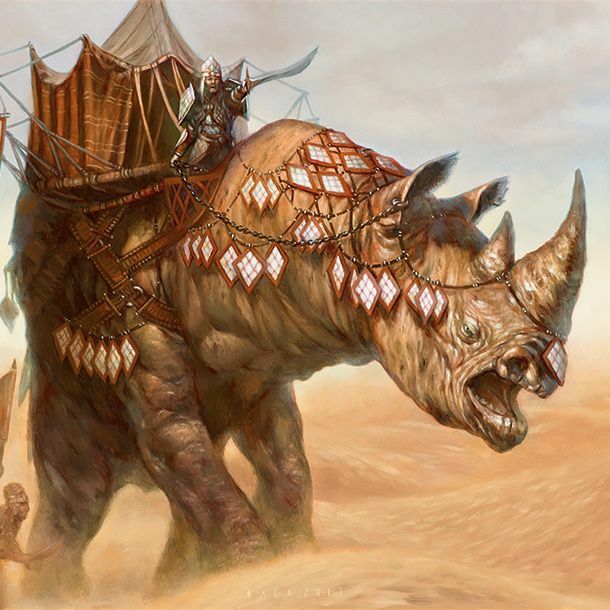 (MtG - "Siege Rhino"). But for the BIG turtles I was thinking something like THIS. Something I can say lives in The Nagawater now (and doesn't like nagas/Yuan-ti). And this is completely unrelated, but I just found it and I have to use it somewhere - Putting giant statues to good use. Yeah, I like that statue. It reminds me of what I was trying do do down in the Cliffside City of Peleverai with the concept of the elf and dwarf statue on the two sides.... except this drawing looks a heck of a lot better than what I did. So I'm looking at Mulhorand at the moment (got bored of Unther and Chessenta). The big questions as usual begin with the gods. What the hell are they exactly. They were physical beings and therefore demigods and they had lots of children of which some were imbued with special powers and were called incarnations. The mulhorandi gods were supposedly barred from ascending to true godhood by the imaskari planar barrier and yet I can find no instance of the mulhorandi gods taking any action or involvement in material plane life since shortly after the Orcgate War. The barrier was supposedly dissolved in 1358 DR so that is 2000 years without the gods doing anything noteworthy. On to the government of the country I'm leaning towards each of the churches being given responsibility for a particular aspect of running the country. THe Church of Anhur runs the military, the church of Thoth runs magic and the wizards, the church of Isis runs the farms, the church of Nepthys is in charge of trade, the church of Osiris runs the courts, the church of Geb runs the mines, the church of Hathor runs the schools, the Church of Horus Re administers to the country as a whole and has oversight over all the other churches. I think of them like 'Chosen' - VERY mortal demigods... but still exarchs. They weren't actually those gods - they never were. Here's how I see it: Ao's rules (or the way he set up the rules of the Crystal Sphere) is that 'Gods' cannot enter without permission (from him), but it does NOT cover the quasi-divine, since they can arise spontaneously (hero-worship, like what happened to the Red Knight). He may not want powerful beings from other spheres entering and wreaking havoc, but he still has to allow for a natural, organic religious growth on the world(s). Thus, in order to enter Realmspace, the Mulan gods pulled a scam - they put part of their divine essence into 'Mortal Vessels' (Chosen) and sent them through Arcane Space* to Toril. So rather than aspects/Avatars which we always assumed, those were just mortal demipowers who were sent, to represent them in Realmspace (and hopefully grow their power there, enough for them to eventually enter in-person). The first generation were probably quite powerful, like Elminster or Khelben, but their bloodlines became diluted over time, as the power was 'spread thin'. The worship of the Pharonic and other Gods may have grown, but they were inadvertently counteracting it by allowing the power to get spread around, rather than just choosing one heir to it. So no gods, but still insanely powerful representatives of those gods (so picture a whole pack of 'Elminsters' fighting the Imaskari Artificers - it would have went very much like that battle between the Chosen and the Princes of Shade... and Tilverton got nuked). *And since I think Arcane space is really just part of the ethereal, this makes even more sense - I never liked the whole 'the Egyptian Gods arrived by spaceship' take on that. And to take this line of thought one step further - Gods CANNOT 'enter the realms'. Not in person. They never really have. The 'Avatars' we saw in the ToT were just that, and not really much more than Chosen (demipowers). Actual gods are NOT ALLOWED to walk around on Prime Material worlds, which is why they send avatars, and have Chosen. Ed has even said that although the gods are 'very active' in the Realms, most of the manifestations witnessed are just that - minor little things so that people know 'the gods are watching'. The god itself never really shows up. Even in the few cases we have where it appears so, those are just avatars, which are little more than a piece of the god's awareness stuffed into a fleshy vessel. It's just an extension of the God's thoughts; the God itself is still in the Outer Planes. Thus, there really is almost no difference between a 'Chosen' and a 'Avatar', power-wise. Its just that one is far more autonomous than the other (and both CAN be killed, but they are tough as hell). In fact, to take this line of reasoning one step further, we might make the assumption that Avatars are ALWAYS 'Chosen' - living Proxies of a god. Anytime a God needs to create one (and they do so RARELY), it has to possess a mortal worshiper to create the Avatar. That could be another really cool way to curtail godly involvement and nerf their power a bit (because there are a TON of dangers involved in this, not the least of which is that they could lose that portion of their power if the Avatar is killed before they reclaim it, and 'good' gods would be loathe to do so, because reclaiming their power would mean the death of the vessel... which is always one of their more zealous followers). Sounds a bit too much like the official explanation which just doesn't wash for me. If they are not the actual God then when the Avatar is killed it shouldn't matter one bit. Once the barrier drops Re is free to come back and so is all the untheric gods. Unless of course you make up days as machine rules to go with it. If they weren't avatars, just an imbued vessel then the death of that vessel doesn't matter at all and everyone can carry on worshipping Re and all the untheric gods. Unless you make up more deus ex machina rules to prevent this. I don't like deus ex machine, I don't like so either. Either they were true gods or they weren't. Either the barrier blocks all divinity or it doesn't. Special arbitrary rules don't cut it for me. Now I think about it, I don't think the imaskari planar barrier was designed to block divine beings. I think they were making a massive dimensional anchor that prevented all planar activity in imaskari. So no teleporting, no summoning, no plane hopping. It keeps the realm safe from errant magic users summoning demons and from teleporting around to make mischief. It also had the side effect of completely blocking anyone contacting the divine or receiving spells from anything not on the material plane. The Mulan gods could grant spells because they were material plane based (only demi gods). The imaskari could still maneuver around their massive empire because they had keys that allowed their portals and gates to be used in the barrier (which was basically the largest mutual ever constructed). Makes far more sense to me than a bunch of wizards who were largely unaffected by divine beings deciding to block them out. If the barrier blocked ALL gods, of ANY power level, then elves would not be allowed in Realmspace (according to the newest information in 5e). I take that a step further though - EVERYTHING is 'part of God', and thus, divine. So it comes down to power-level - its just a power-level cap is all. If something has obtained 'deity' status somehow, it has to be vetted. Anything below 'lesser god' gets in (because demigods are just that - not quite gods). Come to think of it, this could even be one more reason why some uber-powerful beings choose NOT to become 'Gods' (be a deity). The rules completely change when you get to that tier (no direct participation in the Prime Material). At no point in time did those supposed 'Mulan Gods' ever act like Gods, or showed power like that. they didn't even instantly defeat the Imaskari - it was a WAR. And then they had their arses handed to them by the Orcish Gods... when they are presumeably some fo the oldest and most powerful gods in existance. No, those weren't who we think they were. Its better that way, anyway - makes them more 'Realmsian' (especially if we just say it was the avatar-energy that was sent to Toril, and it bonded with native Mulan when it got there). Eventually those religion caught on enough where the actual deities were able to have a presence, but like every other God (in this theoretical setup), they cannot act directly. All of Toril's gods must act through living Proxies, hence the need for 'Chosen' (or Saints, or exarchs, or whatever else you want to call them). This also makes the 'Gods Kings' of Unther and Mulhorand much more like the classical Egyptian model - those were still 'mortals', but at the same time, worshiped as gods. They probably hoped to someday join the real pantheon. It seems the simplest solution here is to just say 'manifestation' is the Mulan term for what is called Avatars/Chosen elsewhere. Which is where I was going anyway. THey are not gods they are less, they are demi gods. They have a physical form and when it is killed they die. They couldn't ascend because of the Imaskari Barrier (I don't think it extended beyond Imaskar's borders) so they remained demigods no matter how many worshippers they had (although ascending must be quite a scary concept, lose your physical form - essentially die - in he hope you will ascend to another level of existence, if you are wrong you are dead). So they physically existed and did heroic things up until the Orcgate Wars and then they disappeared from history and never reappeared. They left governance to their descendants, ignored wars (some costly ones). Where were they hiding? If the Imaskari Barrier were dissolved earlier than 1358 (I don't do Ao) who would know? We usually do talk ourselves into the same corner... eventually. For elsewhere in the Realms I didn't mind (well, I DID, but didn't really have any say about it) all the 'Godly Intervention', but OE has always given us a way out, because the lore specifically states that those weren't the 'Gods themselves', which gives us a LOT of play-room. So they send Autonomous avatars to Realmspace (they'd have to be autonomous so that the Godswall wouldn't block them - the connection to the original god had to be severed), and then when they arrive, they immediately merge with locals, creating the 'Greater Manifestations' (basically, Chosen). This means that although we have some RW deities (which a lot of people never liked), they were never really those beings - they were always Realms-specific powers. I suppose the eventual plan was to re-merge with the 'The Godhood' in the outer planes, once they were entrenched on Toril, but that never really came about - several of them 'jumped ship' for other pantheons, many were killed, and the few that were left - most left in disgust for home (the whole enterprise just fell apart). I like that take - it makes them seem more FR-friendly, and it also allows me to broaden some of that to the Heartlands (what I theorized above - that the ACTUAL God may NOT step foot in the Prime Material, as per some 'ancient accords', or some-such). A God must act through proxies, which means if they want complete control, they have to send an avatar and merge it with a devout follower, but maintaining that sort of control 'burns out' the mortal's physical form, so it is usually better for them to just relinquish control back to the mortal (leaving them with the 'spark' of their power). This is how Saints/Chosen are created. Its almost like a Suel-Lich possession. The God 'uses them', and then leaves them behind, forever changed by the experience. In Elminster's case, this could have been when he was Elmara.